Jean Bell was reading the Wall Street Journal and saw a story about Janie Bryant, the costume designer for the award winning show Mad Men, now in its sixth year. It is, according to their words:” . . . the first basic cable series ever to win the Emmy for Outstanding Drama Series in four consecutive years.” It follows the lives of the ruthlessly competitive men and women of Madison Avenue advertising, starting in the 50s. 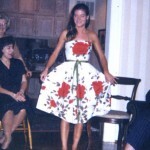 Jean had been watching the show for awhile, admitting that fashion has always been one of her favorite subjects, and she noted that this show, especially, exhibits clothes that were so important to the time when she became fashion conscious; they were the clothes like the ones she wore in the 50s. Then she reads this article about the woman who is responsible for these clothes designs, and Janie Bryant’s story resonates to her own. Janie is a Southern woman who grew up in Tennessee. Her mother and especially her grandmother had been fashion conscious, and this laid seeds for Janie’s growing interests. Each day Jean’s job with the bank took her out on the street checking in with businesses, and she would drop by Miss Lona’s and pick up her bank deposit. In turn Miss Lona would advise of new shipments. Jean enjoyed taking some of her money and spending it on clothes, and she collected some handsome outfits in a time (the 50s) when women dressed more “in costume” with hats, shoes, bags and gloves as a part of the ensemble. Jean said she and girlfriends traveled together, even to New York City, when they had vacations, and their fashions went with them. Not only did she buy these clothes, but she preserved them. Now getting back to Janie. As Jean read about her she felt she had something to offer this young Southern woman. She had learned that not only did this young lady work on the Mad Men clothes, but she has been a writer for a number of fashion magazines – one being the Vogue equivalent in Russia. She has studied in Paris, in New York and then went to LA to take her talents. Jean lost her own daughter Harriett several years ago. Her lovely daughter would have been the recipient of all these beautiful designs of a special era, but with her death, there was no one to save them for (about 75 pieces in all). It then occurred to her that maybe Janie could use them for the show. She contacted her and a relationship developed that is still going. 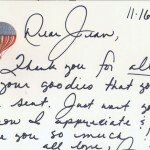 They call each other from time to time, and Janie writes to her, as well as the costume staff, as seen in one note shown with this story. As one might suspect, Jean offered these fashions to Janie and she was so pleased. “She called me,” said Jean, ”and she was thrilled.” Janie said, “Send what you can right away.” And so she did and now they are being assimilated into the wardrobes of these stars, either as actual costumes or they are being copied. “They are having to be altered,” says Jean; she was a size 4 petite. “Most of these stars are zeros and twos,” according to Jean. This happened one year ago. She has even sent, at Janie’s request, peignoirs from Jean’s trousseau. Recently Janie married a musician, and she called Jean to tell her about the wedding. Jean says she feels maybe she is a grandmother substitute. 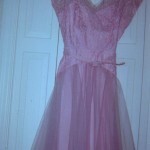 Janie was exclaiming that her wedding dress was a Priscilla of Boston, a style that was especially known in the 50s. Jean told to her that her own wedding dress was a Priscilla of Boston, one that she had seen in a magazine and Miss Lona had ordered for her. Most folks know Jean’s husband. They were married in the1950s. They met when he returned from the Korean War; he had also served in WWII. Their courtship was a whirlwind of several months before their marriage. Jean continued her interest in fashions and this became an asset along the way in that Harry Bell, her husband, became prominent in agriculture. At one time he was named one of the three outstanding men in agriculture of the 20th century. (Bell’s great contribution was in spearheading the drive to wipe out the boll weevil.) 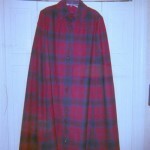 He served on boards and committees, under a number of Presidents, and their travels and appearances during the 60s, 70s and 80s required clothes to meet the demands of these jobs. Her interest in fashion has continued, but the most fun seems to have been in those earlier designs that she held for so long, and now are in the hands of Janie Bryant and the Mad Men costume department. 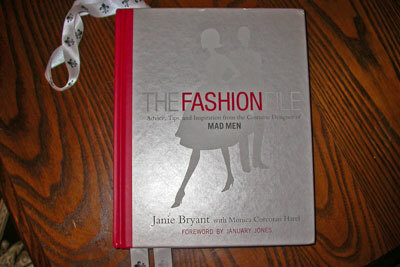 This book recently published by Janie Bryant, costume designer for Mad Men. When Janie Bryant and Jean Bell connected, it was the beginning of something wonderful for both –and for the Mad Men TV series. 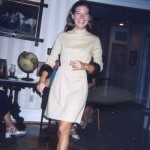 Modeled by a friend at a party some years ago, this is Jean’s favorite: a beige wool dress with mink cuffs on the sleeve. 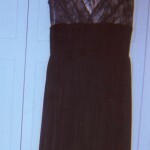 A shift with a beaded neckline, worn by a friend who was taller than Jean. 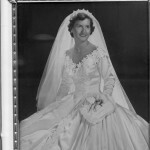 Jean in her Priscilla of Boston wedding dress. The trim is white leaves scattered on the neckline and emphasizing the lines of the full skirt of white silk satin. 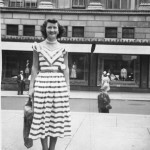 Jean in N Y City in the early 50s, wearing here one of the 50s wardrobe pieces. 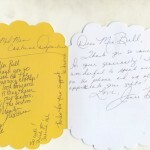 Personal note of thanks from Janie to Jean. A personal thank-you from the Mad Men wardrobe department. 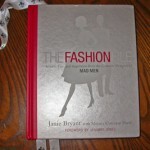 One Response to "The Fashion of MAD MEN and Jean Bell of Ward"